Breakfast is one of my favorite meals of the day (the other two are lunch and dinner!). Seriously, though, breakfast foods are a favorite of mine to such an extent that I can eat them at pretty much any time of day, for any meal. The foods that make up a tasty breakfast may seem simple, but when put together well they can be sublime. Occasionally, though, I hear people say that there’s not a lot of good breakfast joints in Kathmandu. And I’m always surprised by this, because really, there are. You might have to search for them—but that’s part of the fun. Here is a round-up of my favorites, places I go to on the regular. I know there are more out there, too, and I’m always looking. This isn’t by any means an all-inclusive list, rather, it’s my own personal favorites: the places I return to again and again, usually even ordering the same dishes, once I hit on one I love. Mike’s Breakfast is really the starting point, since they’re practically the ones that brought Western-style breakfast to Nepal. Just a few months ago, they finally reopened in Lazimpat, in a large space with plenty of parking, too. But what those of us who have followed them from location to location wanted to know was: is the food the same? I’m delighted to report that it is. This isn’t posh cooking, nor is it supposed to be; it’s hearty, well-made simple American-style dishes, and they’re awesome. I’m particularly a fan of their mushroom omelet and sandwiches, which I often eat for breakfast even though you might not consider them breakfast food. If you are very hungry, or have a friend to share with, their breakfast burrito is a monster stuffed full of goodness. A plus for me is that you can order breakfast anytime of the day here. Not far from Mike’s new location is Curilo, where my go-to breakfast order is the bacon, egg, and cheese bagel. It’s not really a bagel, but a soft bun with a hole in the middle. It doesn’t matter, though, because each component is perfectly cooked, the oozy cheese bringing it all together. It’s served with a fresh salsa, pico de gallo style; this surprised me at first, but one bite, and I was a believer. Heap a little of the tangy mixture on your sandwich before you bite and feel happy that such a combination of flavors exists. Sadly, they are quite strict with their timings: get here before noon, or no breakfast for you. Cafe Soma can’t be left out of the breakfasts list. Go to the original in Jhamiskel, or the relaxing garden in Baluwatar, and enjoy. A favorite here is eggs Benedict and its variations—I’m a fan of the original, with ham, but my niece was so crazy about their Benedict with smoked salmon that during the months she stayed with me she became a regular here, often visiting several times a week, always ordering the same thing (it must run in the family)! Breakfast can also be ordered all day here. Another place with great eggs Benedict and great breakfasts is Le Sherpa. It’s a little pricier than some of the other options I’ve listed, but it’s lovely for occasions when you are celebrating or just want that little extra something. And, while it gets packed out on Saturdays during the farmer’s market, here’s an insider tip: you want to go on Sundays. 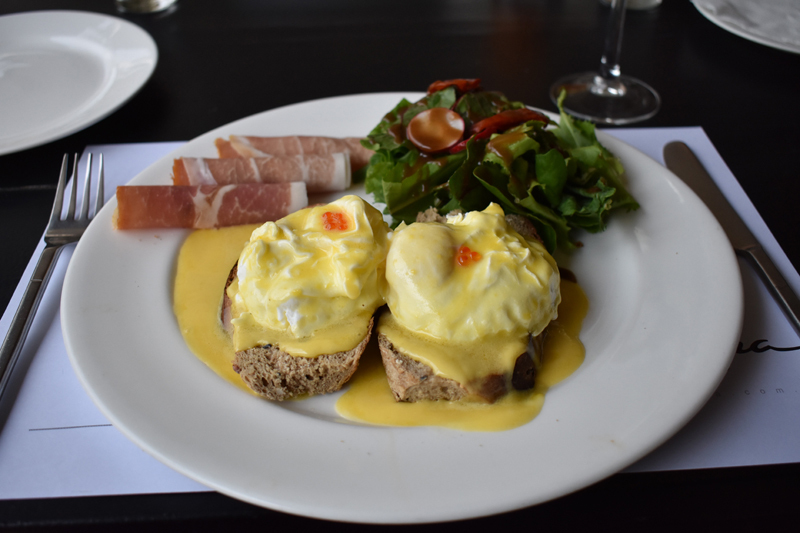 Their Sunday brunch package is a steal; for a fixed price, you can enjoy a main breakfast dish of your choice (like that eggs Benedict) plus a cup of tea or coffee, and as much freshly squeezed juice, yogurt, granola, and fruit as you like. It’s an amazing deal. A recent addition to my list of eggy, meaty, cheesy favorites is a new place called Coffee Chain, in Jhamsikhel. They serve bagels with a wide choice of fillings: I had the sausage, egg, and cheese, and looking at the photo I took that morning makes me hungry every time. It’s just an amazing breakfast sandwich, and unlike the previously mentioned one, their bagel is really a bagel. This is a new find, but I’ll be a regular here before long, too. There’s no shortage of good things to eat for breakfast around here, and my plan is to keep finding more.